The issue I pulled for today was #123, but a quick look lets me know I had already done that one back in May. I mentioned then I had extras, but I guess I forgot to sort this one out. No worries. Grabbing the next one. I have made no secret of my general dislike of the various "funny" April Fools editions of Dragon magazine. Not that I have anything against humor in D&D/RPGs; quite the contrary. I just like good humor. 9 times out of 10 the jokes fall amazingly flat. Issue #96 is that 10th one that actually works. In fact, this is one of my most fondly remembered issues of Dragon during what I think of as my heyday of AD&D. So with that in mind lest have a look at April 1985. Ladyhawke and Cat's Eye are in the theaters, I am in my sophomore year in High School and this is This Old Dragon issue #96! Again, the cover here is missing. Popping in my Dragon CD-ROM. The cover comes from Jack Crane and really fits the issue not at all! Well, fits it in terms of humor. But do not expect a mechanical dragon any time soon. I like the cover though, it's fun. The Editorial made me laugh I admit. Printing the whole thing backward was a neat idea. I tried to do something similar with my high school newspaper and found it really difficult. This was a time before we had computers and nice layout software. The Letters section is a mix of real and supposedly humorous ones. Up next is an ad for Pendragon that always caught my eye. I wanted to run a King Arthur/Camelot game once upon a time, but never quite got there. Too bad really, I think it would have been fun. Another "important" ad. This one is for "Dragons of Autumn Twilight" the first Dragonlance, and first AD&D, novel from TSR. 1985 was that year of transition. The Golden Age was over, though I didn't know that at the time, and the Silver Age was upon us. This time has been described by some as the "Hickman Revolution". There was certainly a shift that even I could feel in my little Mid-West town to me it felt like things were getting more "modern" in terms of production value. We are still a little bit away from the release of the Unearthed Arcana and the end of Gygax's involvement with all things D&D. Speaking of the Old Master, Gary is up with From the Sorcerer's Scroll on New Jobs for Demi-Humans. There is a lot here really, though most will see the light of day in UA. I am not sure if I had played an Elven Ranger before this or not, but I know I rolled one up around this time. To me, it seemed natural. In fact, it is something you can see with my own Huntsman class. There is a little bit on Paladin dual-classing I took to heart. I loved to play Paladins back then (still do in fact). I often would play clerics to a certain level (usually somewhere between 3 and 10) and then pick up the Paladin class if it was possible for my stats. It was easy to rationalize; the character had to spend time in the normal service of his god (which was almost always Pellor for me) and then move up to Paladin status. Worked remarkably well. I did the exact same thing with my current D&D 5 Cleric/Paladin. For me THAT is the real Hickman Revolution; allowing me to play the character I want and the rules supporting it, not looking at the rules and deciding what character to play. It's less about "what Hickman did to D&D" and more about the direction D&D was going to go anyway. Following up on this is Katherine Kerr's What Good PC's Are Made Of. Kerr has written a number of articles for Dragon and this is just before her first novel is published. She gives us some basic background information for characters including how/where the characters grew up and what their social class is. It's actually interesting enough to keep for a lot of FRPGs. Ed Greenwood is up with Ecology of the Gulgurtha which is a surprisingly interesting article on the Otyugh and the Neo-Otyugh. I recall coming up with a few ideas for these. I seem to recall reading somewhere about using an Otyugh in the bottom of a cistern to eliminate waste. I also created a giant otyugh. The Handy Art of Forgery by Keith Routley was another great article. It's still rather timely. I showed it to my son, who is my local D&D 5 expert, he he thought it would work well enough to expand the Forgery skill of the Assassin specialization for Rogue class. I am sure it would also work well for the AGE Rogue/Expert class with the Assassin specialization. Arn Ashleigh Parker discusses how to incorporate ideas from books in Books to Games? Perhaps! The advice is sound, if simple. Some examples are given such as Gor, Barsoom, and Middle-Earth. Despite there being a nice big ad for the D&D Companion Rules, you would think that D&D was a dead line at this point. I also can't recall if I was excited at seeing this or not. I have spent a lot of time talking about those rules here, I would have thought I would have remembered this a little better. An article on Play By Mail updates. The special section of the issue is the April Fools section. Up first is the "adventure" Nogard. I'll make two confessions here. 1. I liked this, a lot. We wanted to use this and play it seriously. 2. It took me an embarrassingly long time to realize that Nogard is "Dragon" spelled backward. 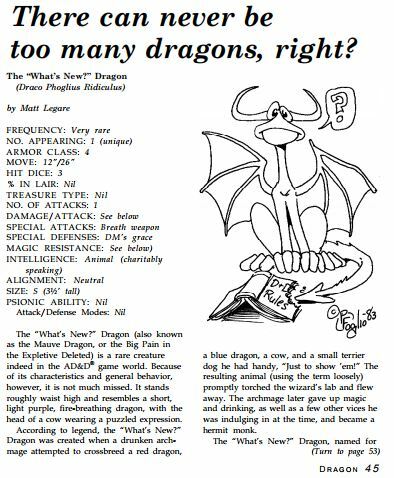 The "What's New Dragon" is also featured in There Can Never be Too Many Dragons. Fun little critter. Odd it was published after the What's New comic was no longer in the magazine. The next dragon is the "Quazzar Dragon". We joked about actually using this monster too. We took it seriously when the Frequency said: "Only Once". Though at 120,600 KM across (75,000 miles) we never had a dungeon to put it in. And....it goes downhill. The Meanest of Monsters details the Killer Dungeon Master monster. Not a fan BUT there is something here I have loved and used before, the Wandering Damage Table. I have pulled this out when dealing with younger players that are getting rowdy. I play it lightly, but it always gets their attention. Since I have that more or less memorized I ripped this one out and gave it to my son. Sorry +Greg Littlejohn. Huh...comical races, hopeless characters...can't bother really. I skipped over the map of Ginny's Delight. I'll talk about that in a bit. Craig Barrett is back with some DragonQuest rules for swimming in Getting in Over Your Head. One day I'll have to get a copy of DragonQuest and play. Maybe at a con sometime. First up is Dale L. Kemper with These Are The Voyages of the Ginny's Delight. While the adventure itself didn't really appeal to me I loved the little ship Ginny's Delight. The map of the ship is in the middle of the magazine. It's about the size of a large DS9-era Runabout. It's not an attractive ship but there something about it I really like. I converted it over to Star Frontiers and Doctor Who (FASA version). Why is This Mutant Smiling? from John M. Maxstadt covers new mutations in the form of exta limbs and body parts for Gamma World. This would also work well for Mutant Future or Mutant Crawl Classics. Marvel Phile is mostly here. Whoever owned this before me had cut out the section on Iron Man but left Howard the Duck. Convention Calendar, ads, a big spread of Wormy and three pages of Snarf Quest. In truth, this was a fun issue and one that seems have had a much larger, lasting impact than I originally remembered. I mean I remember where I got Ginny's Delight, but the Otyugh and the Random Damage table origins had been lost to my memory. Curious to see what White Dwarf was up too at the same time? Well, check out my review of White Dwarf #64 from April 1985. Will do. The Dragons are not in order and most are missing covers. I totally remember this one. You and I are about the same age, and as a "kid" I remember really liking this one, mainly for the expanded roles for demi-humans, because I could finally, as you noted, play the character that I wanted to play in an "official" capacity. Well, except that these new rules still wouldn't let me play a half-elf multi-class Illusionist/Paladin, which for some reason is a class I really wanted to play from the first time that I ever saw the AD&D Player's Handbook. I also remember very well the "Books to Games" article because it was one of the first things I read that made it seem like it was okay for me to tweak things in my game to achieve the kind of effect I wanted. Up until then, I was strictly "by the book" because Gary said that if you didn't do that, you were no longer playing official D&D and it would ruin your game. The other article in this one that had a huge impact on me as a kid was the Gamma World article, because it was pretty much tied with D&D as my favorite game but I felt like TSR never really did much to support it past the boxed set with the exception of the occasional module here and there. Thanks for the trip down memory lane! I still have all of my Dragons, from about issue #76 onward all the way until the print edition ended, plus a decent selection of issues from #41 - #74 and the Best of Dragon Vol. 1, 2 and 4, but they are all in boxes in the garage, so I never really get a chance to read them. "Wandering damage." Yeah, I seem to remember us using this one, back in the day.